Dealing with online trolls is never a fun thing to have to do. Indeed, many people will recommend you don’t pay any attention to them, as all that’s likely to do is incite further trolling. It’s a vicious circle that, regardless of circumstance, pretty much leaves the victim at the hands of the trolls’ comments. Racist comments are hardly a rarity online – unfortunately, equal access for all means equal access for the abusers too; that’s the price of freedom in this case. However, anti-racism campaigners in Brazil are dealing with online comments in a way that should really hit home for the people leaving the remarks. 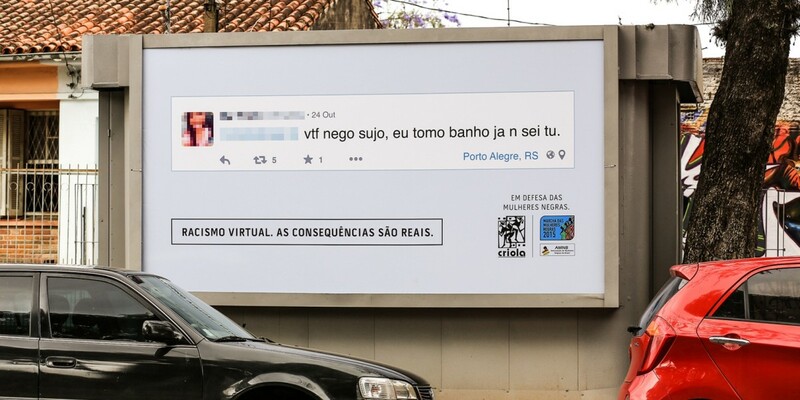 The project is called ‘Virtual racism, real consequences‘ and sees real racist comments left on social media put on billboards near the posters’ houses. The group says it finds out the neighbourhood of where the comments were named from the geo-tagging functionality, and then rents space at an appropriately close location. Clearly, the idea behind it is to try and drive home that while comments made online might feel divorced from reality (or the potential to cause real harm), they’re really not. Unfortunately, an essentially anonymized public posting is unlikely do deter a lot of the people leaving racist remarks, but if it even causes to think for a minute, it’s a start.